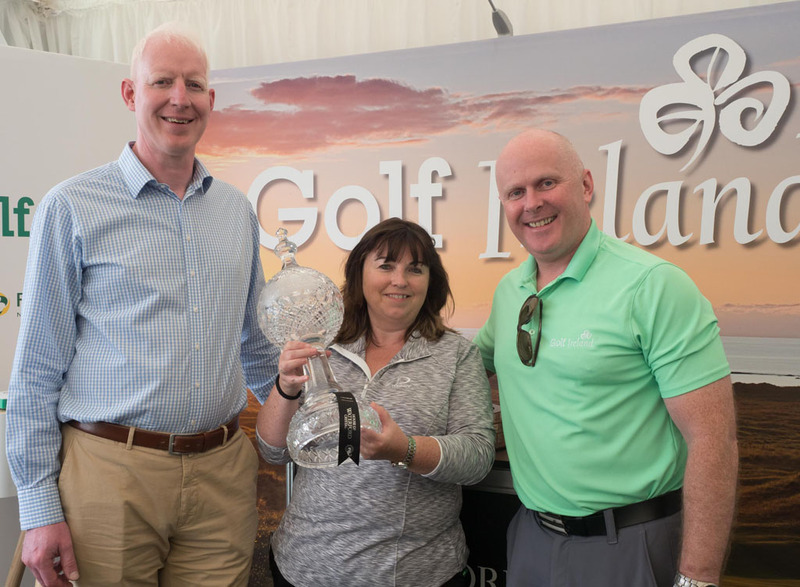 Pictured at the Golf Ireland tent at the Dubai Duty Free Irish Open in Donegal’s Ballyliffin Golf Club were Jackie Wade, Doonbeg Golf Resort with Paul Kelly CEO Failte Ireland and Martin Donnelly, Business Development Manager Failte Ireland. Fáilte Ireland provided a platform for over 30 Irish golf businesses, including Doonbeg’s Trump Internatioinal Golf Links and Hotel, to showcase their offerings to 80,000 overseas and domestic visitors attending the Dubai Duty Free Irish Open in Donegal’s Ballyliffin Golf Club. 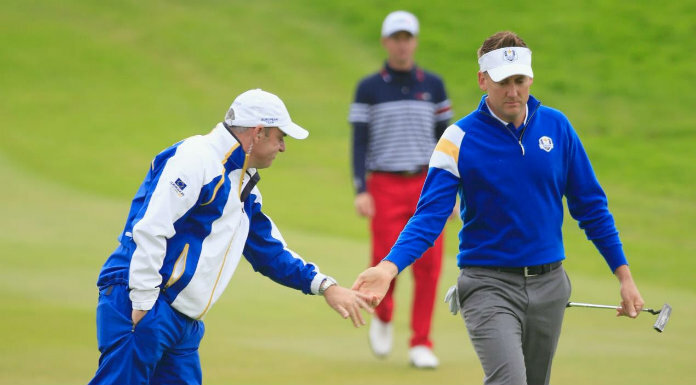 As a key sponsor of the Irish Open, Fáilte Ireland brought top Irish golf trade from every corner of the country to the event to promote golf tourism experiences across all regions, and across a longer tourism season. Trump International Golf Links & Hotel, Doonbeg joined Fáilte Ireland’s pitch at the event. Golf tourism is an extremely lucrative sector for Ireland with golfers being amongst the highest yielding visitors to Ireland. Ireland is home to a third of the world’s links golf courses, and over 200,000 overseas visitors take part in golf during their visit every year, contributing almost €270 million to the economy and driving over 1.7 million bed nights right across the country. Fáilte Ireland’s Business Development Manager, Martin Donnelly, emphasised: “At Fáilte Ireland, one of our key priorities is spreading the footprint and benefits of tourism across the whole country. With some of our finest golf courses based in areas which have the capacity to host more international visitors, we believe that golf is an important driver in attracting more visitors to the regions. 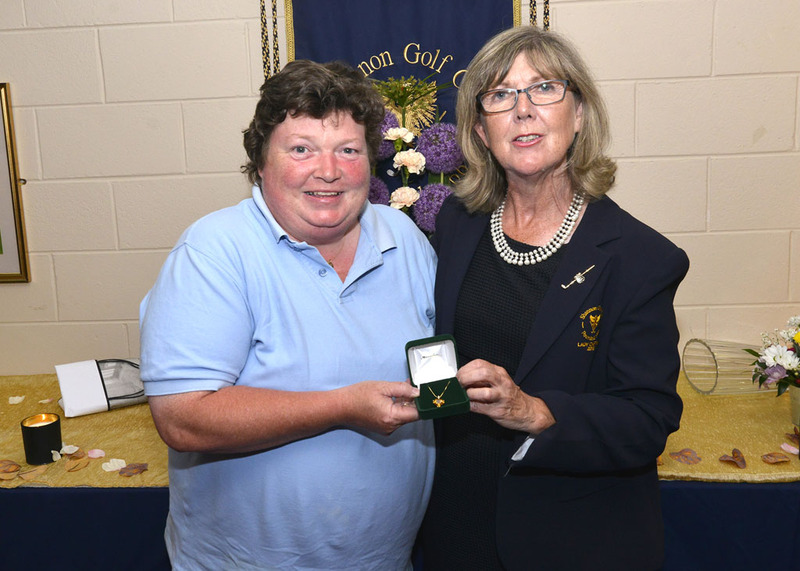 Maura Killackey, Roscrea, was the winner of the ladies open day at Spanish Point last week with 41 points from Irene Neylon, Kilkee, with 40, Colette Colleran, Dromoland, with 34, Kitty Quinn, Dromoland, with 33 and Mary O’Brien, Adare, with 32. Val Shannon won the gross with 26 points. The lady captain’s (Ann White) charity day in aid of the Diabetes Federation of Ireland was a huge success. In the members section the winner was Bernadette O’Gorman with 32 points from Yvonne O’Keeffe with a similar score. They were followed by Val Shannon with 31 and Maura O’Boyle with 30. In the visitor’s section the winner was Rupert Bagnall with 34 from Maureen Clune with 28, Philip Ryan with 28 and Sue Mullen with 28. In the ladies 18 hole stableford competition on Sunday the winner was Valerie Ross with 39 points from Maura Burke with 38 and Mairead Bergin with 35. The lady captain’s mixed foursomes at Ennis last week was won by Anne Kelly (21) and Alan Butler (2) with 41 points from Rita (20) and Walter O’Brien (13) with 36 points. In third place with 37 points were Geraldine O’Mahony (23) ad John Guilfoyle (15) while the gross was won by Della Burns (15) and Johnny Kearse (13) with 24 points. Last Wednesday’s 18 hole stableford winner was Ethna Murphy (28) with 36 points from Cora Kerins (24) with 24 points and Jean Molony (20) with 20 points. In the nine hole stableford competition the winner was Anne Kelly (21) with 19 points from Liz Kelly (32) with 18 points and Bernie Brooks (28) with 16 points. Tuesday’s senior ladies scramble was won by Ann Casey, Deidre Molyneaux and Mary Rowe from Patricia O’Donnell, Pauline Parks and Mary McMahon. Third were Peg Cleary, Claire Ruane and Jean Moloney while fourth place was filled by Ann O’Loughlin, Mary Colton and Maura O’Rourke. Gerard Connellan (22) was the winner of the Friday open singles with 42 points from Seamus Mann (21) with 40, Brian Considine (17) with 38 and Cormac O’Neill (20) with 38. Keelan O’Flaherty (6) won the gross with 31 points. The Tuesday evening fourball was won by Padraig Ryan and Johnny Kearse with 35 points from Brian Tuohy and Tom Greene with 34, Ger O’Brien and Matt Flynn with 33, Leo Herbert and Mike Kearney, also with 33. Wednesday’s nine hole scramble winners were Pat McInerney, John Vaughan and Pat Cuddy with 27.7 from Andy Cregan, Tim Kelly and Shane Collins with 29.4. Seventy one members played in the senior men’s three ball modified scramble last week when the winners were John Guilfoyle, Sean Daly and Tony Blake with 77 points. They had one to spare over Pat Cusack, Mike Butler and Michael Kenny who were followed by Joe O’Brien, Pat G. McInerney and Tim Kelly, also with 76, Luke Coote, Tim McAllister and Brendan Colton with 75, Pascal ‘Russell, Bernard Hanrahan and Brian Considine with 74, Pat Rutherford, Peter Quinn and Paul Mockler with 72, Brian Warner, Matt Flynn and Eamonn Corry with 72, Charlie McEnery, Ger O’Brien and Brendan Pyne with 72, Ned and Sean Ryan and Tony Kehoe with 71. Eamonn Scanlan was the winner of the Friday open singles at Dromoland with 44 points from Colm Beakey with 37 and Diarmuid McMahon with 36. Eddie King was the winner of the nine hole competition with 22 points from Shane O’Brien with 21 and Vincent Sherlock with 21. John O’Grady won the mopnthly medal, a men’s 18 hole stroke competition, at the weekend with 66 nett from Paul Cusack who had a similar score. Ian Mulready was third with 69 while Ronan O’Brien won the 18 and over category with 69. Jean Colleran was the winner of the ladies 18 hole stableford competition with 39 points from Mairead Bergin on 38, Michelle Bennett on 36 and Ann Nix with 36. The Dromoland Intermediate Scratch Cup competition takes place on Sunday. Last Monday at Kilkee the ladies played an 18 hole stableford competition which was won by Elizabeth Williams (25) with 37 points. She was followed by Ann Fox (29) with 37 points and third was Deborah Fitzpatrick (29) with a similar score. The nines were won by Anne Boyle (14) with 17 points and Marie McGuire (21) with 21 points. In the ladies Woodstock competition Kay Enright was first with 39 points from Niamh Lenahan with 37 and Irene Neylon with 36. The Lady vice captain’s (Marion Kennedy) competition was held on Saturday when the winner was Sarah Clifford (24) with 41 points from Niamh Lenahan (27) with 40 and Anne McCarthy (26) with 39. The nines were won by Kay Enright (356) with 20 points and Fiona McGann (7) with 23 points. The nine hole competition was won by Kay Hickey (32) with 21 points from Helen O’Connor (35) with 17 points. Ann Casey, left,receives Patricia Enright’s Lady Captain’s prize at Shannon Golf Club. The men’s nine hole singles competition winner at Shannon was Adrian Carew (13) with 21 points from Brian Lonergan (7) with 20 points. In the open singles competition Frank Mitchell (26) with 41 points from Michael Allen (8) with 40 points, Robert McNally (15) with 39 points and Damian Casey (3) with 35 points. P.J. Leahy (13) won the intermediate scratch cup at Shannon with 83 from Paul McElligott (13) with 84 and Damian McGuire (12) with 85. Ronan Murphy (16) won the nett with 72. The winner of the minor scratch cup was James Kerans (20) with 92 from Dermot Gavin. In the men’s open singles the winner was Raymond Hehir (16) with 44 points from Jason Regan (16) with 42 and Eoin Collins (12) with 42. Ed Hickey (2) won the gross with 34. In the senior ladies nine hole competition the winner was Mary Geraghty (31) with 20 points from Eileen Sherry (36) with 18 and Jvoti Patel (32) with 17. The ladies senior scramble at Kilrush last week was won by Clare Pyne, Lucy Hayes and Kathleen Haugh from Carmel Lillis, Freda Moran, Bernie Tubridy and Marion Brennan. Third were Jean Lorigan, Peggy Mulqueen, Mary Collins and Margaret Griffin. The men’s singles competition winner last week was Noel Thornton with 64 from Sean Lyons with 66 and Tommy Downes with 68; Jim Young junior won the gross with 75 while the category winners were Pat Brennan with 70, Brian Scanlan with 69 and Michael Hogan with 70. In the ladies singles the winner was Muriel Kiely (30) with 43 points from Ann O’Loughlin (16) with 42, Olivia McCarthy (22) with 42, Marianne McGough (20) with 41 and Mary G. Nolan (20) with 40. Niamh Whelan (9) won the gross with 41 while the category winners were Ger Burke (18) with 40, Mary Young (21) with 36 and Lucy Hayes (29) with 39. Ann McMahon won the 12 hole competition. In the mixed scramble on Friday the winners were .Freda Moran, Joe Linnane and Michael Studdert from Claire Pyne, Brendan Carey and Michael McNamara. Third were Anne Brennan, Pat Shannon (Kilrush) and Pat Cussen. The men’s open singles winner was Michael Hogan with 42 points from Paul McGibney with a similar score. Mike Ryan (Limerick) was third with 40 points followed by John Holmes with 40. Sean Moran won the Jim Young trophy with 63 from David Browne with 64 and Michael Studdert with 64. Jim Young junior won the gross with 67 while the category winners were Robert O’Brien with 70, James Murtagh with 67 and Bill Murphy with 65. The president’s prize (Tom Cleary) will be played for on Saturday, July 21. Cormac Walsh (5) won the open singles at Woodstock last Wednesday with 43 points from Keith Farr (6) with 41 points and Edward Maher, Thurles, (6) with 40 points. Brendan Keogh (15) had a hole in one at the 8th. In the club singles v par at the weekend the winner was Tm Dormer (17) with 5 up from Ray Casey (5) with 5 up, Tony Neville (11) with 5 up, Keith Farr (6) with 4 up and Edward Casey (13) with 4 up. The winner of captain’s (Bernardo Kelly) fourball competition for the ladies were Fran Feighery and Fiona Landy with 46 points. The lady captain’s (Kathleen McEnery) prize will be played for this weekend and a big entry has been received. Wednesday’s open team of three at East Clare was won by Nuala and Kay Meade and Abbie Buckley of Kanturk with an impressive score of 97 points. In second place with 89 points, were Fiona O Boyle, Ann White and Geraldine Reddan from Spanish Point. Evelyn and Noreen Skehan and Marie Donnellan were third with 77 points. The lady captain’s (Noreen Skehan) prize was played for on Sunday when the winner was Terry Mulvihill with 40 points from Marie Donnellan with 39 and Geraldine McNamara with 38. They were followed by Mary Brennan with 38, Maureen Clune with 37, Margaret Lynch with 36, Deirdre Cooney with 36 and Bernie Cox with 35.Brid Hayes won the gross with 24. The past captain winner was Peg Hanrahan on 35 pts. Noreen Doyle won the front nine with 22 points while the back nine was won by Ann C Harte on 17. Last week’s ladies fourball winners at Lahinch were Sinéad Sexton (+2) and Stephanie McGrath (7) with 42 points. Saturday’s men’s singles on the Castle course was won by Pat Tiernan (17) with 43 points from John Morrison (9) with 43 and Alan Donegan (11) with 42. The men’s singles on the Old course on Sunday was won by Damian Gleeson (3) with 41, from Paul Monrgomery (8) with 39, Ross Fitzgerald (3) with 38 and Niall Morrison (2) with 38. Mark McGrath won the gross with 36. In the ladies singles competition the winner was Anna Glynn (245) with 38 points from Ann O’Sullivan (28) with 36 points, Catherine McKenna (18) with 35 and Joan Barrett (16) with 35. The gross was won by Val Shannon with 27 points. Ger Rush (15) won the lady president’s (Ann O’Sullivan) nine hole competition on the Castle course with 18 points while the 18 hole winner on the Castle course was An n O’Shaughnessy (27) with 43 points. On the championship course the competition winner was Georgina Condon with 41 points from Sinéad Sexton with a similar score. Helena Tiernan was third with 38 followed by Margaret Ann Killeen with 38, Emily chambers with 38, Marjorie Ahern with 38, Rina Hanrahan with 37, Niamh Wwhelan with 37, Grainne Hennessy with 37, and Barbara McEvoy with 37. Olivia Lucas won the gross with 34. In the silver category the winner was Jacqueline Joyce with 36 from Catherine McKenna with 36,Suzanne Hassett with 35 and Mary Fahey Coen with 35. Martina McInerney won the bronze section with 35 from Maria Nolan with 35, Una Cronin with 35, and Elaine McElhinney with 34. Mary McInerney won the front nine with 20 points while Rosaleen Frazer won the back nine with 19. Eileen Corry with 30 points was the winner in the 30 plus handicap category. Holes in one were recorded by Rhona Carmody at the 5th and by Evelyn Lyons at the 8th. In the Galway exchange day the winners were Aedin McCarthy, Yvonne Morrison, Catherine McKenna and Lourda Glynn with 93 points from Elizabeth Blake, Connie Fahy, Della Malone and Evelyn Lyons with 91. In third spot, also with 91, were Ann O’Sullivan, Anna Glynn, Jean Molony and Pat Ramsey. The ladies 18 hole stroke competition at Portumna was won by Helen Holohan (21) with 70 from Loretto O’Grady (26) with 72 while Betty Parnell (24) won the seniors section with 72. Sixmilebridge society members will have an outing to Shannon on this Saturday when the tee is reserved from 10am. John Moylan (12) was the winner of the men’s singles at Gort at the weekend with 41 points from Patrick J. Phelan (17) with 40 points and Ciaran Daly (7) with 39. 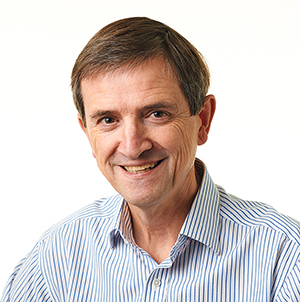 The gross was won by John Greer. Last Wednesday’s open singles was won by Kieran Herbert (24) with 40 points from Tom Costello (18) with 39. Thirty two members played in the Cranny-Coolmeen captain’s (Michael Meaney) prize at Ballykisteen last week. The winner was Tom Cleary with 38 points from Michael O’Connell with 35 and Gerry McMahon with 34. Category 1 was won by Tom Coffey from Oliver McNamara. James Clancy won category 2 from Francis Kelly and Christina Daly won category 3 from Michael McMahon. Pat Meaney and Pat Shannon won the nearest the pin prizes, Ray Shannon won the past captain’s award while the nines were won by Paul Kenny and Gerry Meaney.